Our range of mechanical foam fire extinguisher is manufactured from quality-tested components. Available in various specifications, these foam fire extinguisher are suitable for fighting fire of Petrol, Oil, Paints, Spirits, Chemicals and Flammable liquids fires. We are long-time established manufacturer, distributor, importer and exporter of Foam Fire Extinguisher. I. AFFF is available in 3% / 6% concentrate. 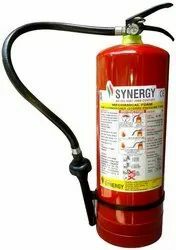 Leveraging on our years of industrial experience, we are offering customers Foam Fire Extinguisher. Owing to our domain expertise, we provide a wide range of Fire Extinguishers with ISI- mark that adhere to various international quality standards. These are very eco-friendly, highly portable and robust in designs. - Suitable for Fighting Fire of Petrol, Oil Paints, Spirits, Chemicals, Flammable Liquids etc.